Kitchen Corners: Solving your kitchen problems one giveaway at a time! Solving your kitchen problems one giveaway at a time! What's more delicious than food? PAPER! I love paper so much I could practically eat it. Today's giveaway is sponsored by three different shops that make cute paper products for your kitchen. The first shop is sugar and meringue whose specialty is vintage designs such as the cupcake toppers featured above and these other products featured below. She also happens to have one of my favorite blogs in the world that makes you crave cupcakes every time you look at it so beware. 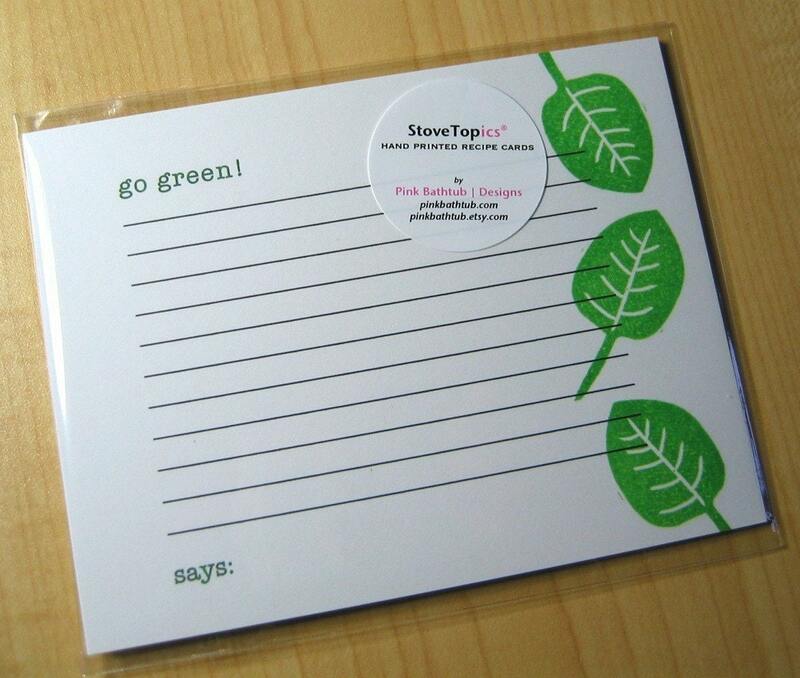 The second shop is Pink Bathtub who is giving away the Go Green recipe cards. When I saw this shop I knew right away that I needed to have some of her recipe cards. They are so beautiful and now that I am looking at her stationary I might have to get some of those too. The third shop is the first all Paris etsy shop. Since it's back to school week you get a set of hand painted bags for each day of the week. Everything from this shop is hand painted including all the lovely dishes. So what do you have to do to win all three products? You just need to leave me a comment by next week Tuesday September 2nd telling me what your favorite product is from ONE of the stores. However, if you want to say something nice about all three that would be great. Only one comment per person please. This giveaway is open to everyone including those residing outside of the U.S.
OOOOO, very pretty! Paperproducts are a must! Especially for baking and place setting. Very beautiful! i love vintage! So creative, and makes every kitchen more inviting! Beautiful cards and paper products. 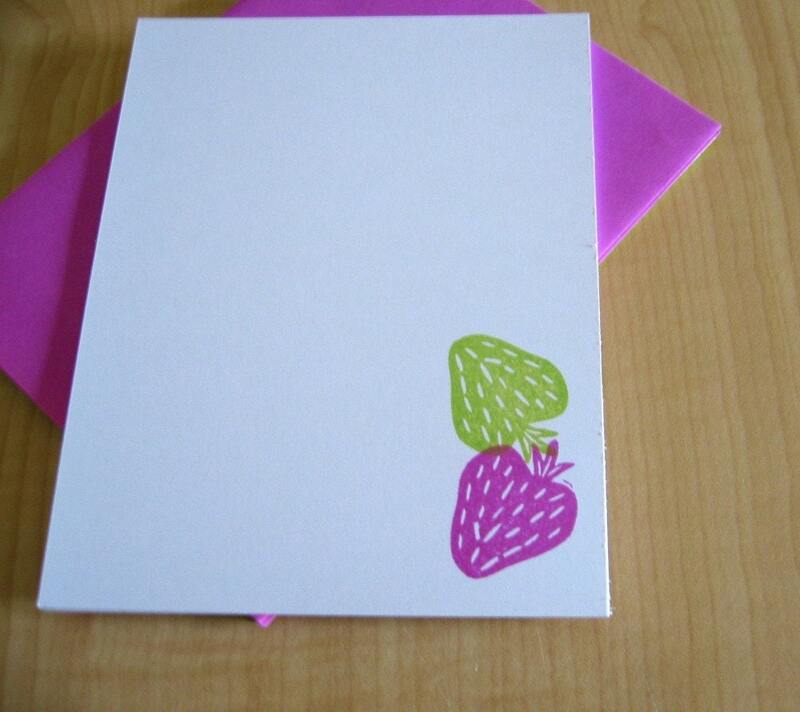 I liked the Wheelbarrow note cards from Pink Bathtub Design. Great for the upcoming season too, with all the yardwork preparing for winter. How adorable! I love everything! Beautiful! I really like the Oui Oui - Pink and Fun French Bookmarks with Charms from Paris Etsy Shop. Thanks for the chance. From sugar and Meringue, I loved the hot stuff potholders. From Pink Bathtub, I enjoyed the Pea Pod recipe cards. From Paris Chic, I liked the paris coffee mugs. I really like the Blue Snail Flat Note Stationery from Pink Bathtub. I love the vintage Betty Crocker cookbook from sugar and meringue. I like the vintage donut maker at sugarandmeringue! I like the art cards from Pink Bathtub. I love "Oui Oui - Pink and Fun French Bookmarks with Charms" from Paris Chic Boutique; "Lily POnd Flat Note" from pinkbathtub; and sugar and meringue has the cutest stuff recipe cards! I love anything Eiffel Tower, so everything at Paris Chic is great. I especially like the cabinet knobs. Thanks for the chance! From pink bathtub what a great selection of recipie cards!! thanks for the chance! the vegan bowl from the parischic shop. I love them all...your note cards with the blue birds are so cute and I love your Go Green for Green Thumbers - Gardeners Reusable Market Tote. This is a great sweeps. Thanks for a chance to win it! Having spent 2 years in Paris after college away back in the 50's I have always loved the city as no other and been back for a visit as often as possible over the years and the articles for sale on the Paris Chic shop are really tres chic, not at all touristy as one would expect but the cabinet knobs on page one are my favorites although the desert plates are really nice too. I love the hand painted name tiles from the paris shop. The vegan bowl from Parischic Shop is my choice. The Vintage donut maker is fantastic! I love this kida stuff! Pick Me! Pick Me! 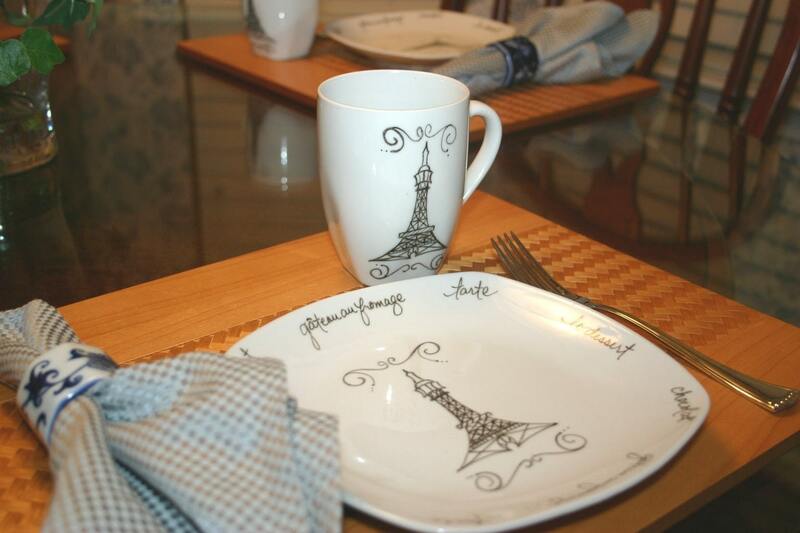 Paris Chic Boutique's Paris Cafe Cups Mugs Set of 4 with Eiffel Tower in French are tres chic!!! I would feel glamorous serving coffee and tea to my friends and family in those trendy mugs!! Thank you for the contest! What cute stuff they ALL have! Little Frenchman (Prince Charming Bib)... I'd LOVE for my son due in October! I might have to buy this! Great contest, I'd love to win! I added them to my favorites on my shop too! 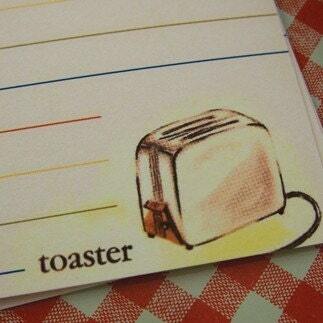 These would be great for my homemade baked goodies. Blue Snail Flat Note Stationery set is my favorite. Love the snail...Thanks for the giveaway. Want the vintage donut maker. Great items. I really like the Eiffel Tower Cabinet Knobs. Thanks for the chance to win. My favorite is the Paris cabinet knobs at the Paris Chic Boutique. However, I'm a sucker for paper and really like the vintage recipe cards from sugar and meringue and the "stovetopics" recipe cards at pink bathtub. I like the Paris bookmarks. I like the Oui Oui have some Tea tea pot from Paris etsy shop. I love the Goldfish Flat Notes from Pink Bathtub. I love all the shops! My favorite from the Sugar&Meringue is the vintage hostess apron; from the Pinkbathtub, I like the mason jar recipe cards; and the hand painted initial tiles from the Parischicboutique are just fabulous! 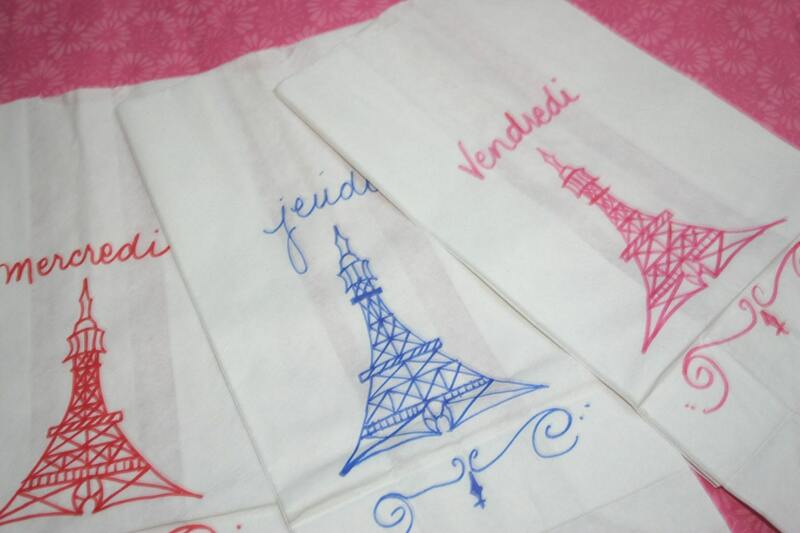 The Paris themed paper bags--Vive La France! Oh how nice to come across a new blog and a giveaway competition too! I love the shop Sugar and Meringue and my favourite item is The Particular Cook's Cook Book. I have had my eye on it for a while. I love so many of her items and her blog is always fun to read too. Do you have any idea how much I love the Parischicboutique shop? I'm crazy about all things Paris at the moment. I love the Paris Eiffel Tower Bookmark or Scrapbook with Metal Heart Bonjour, Croire (believe) Mon Cheri, Amour. Sweet! I love the bibs and the Eiffel Tower Wall Hanging with Big Beautiful Red Bow. I love that store!!!! I like the starfish notes at pink Bathtub. Beautiful cards and paper products. I love the Reusable Fleur de Lis Market Tote from the Paris etsy shop. Thanks! 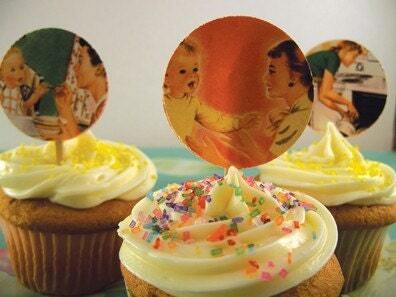 I have a friend who would think she had died and gone to heaven if I got her some of those awesome cupcake toppers! What a cool idea and store. I love everything at Sugar & Meringue's, especially the Recipe Cards and Vintage Cookbook. I like the little pinkbathtub's blue snail note cards. Everything is neat! I like the Fleur de Lis Market Tote from the Paris shop! I loved the Vintage Bottles of Colored Sugar, the wine bottle gift tags and the fleur lis market tote. I like the painted tiles fromn the Paris site. Thanks for the giveaway!! I love everything! But I like the Blues and Seas of Lavender. *ooh so many goodies! * love emily's treats! appreciate being in this! 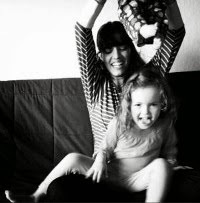 oh my-how my heart beats-your blog is over the top fantastic...singing and skipping-jo. I love the vintage straws from sugar and meringue! 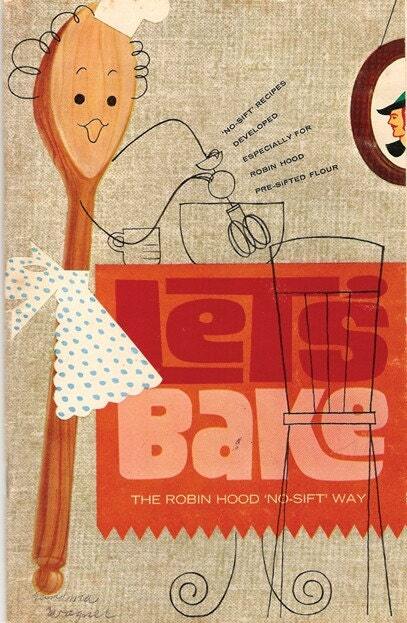 I love the Vintage Royal Cookbook!